CFP10 (10 kDa culture filtrate protein) is a low molecular weight protein isolated from Mycobacterium tuberculosis culture filtrates. CFP10 and the 6 kDa early secretory antigen of T cells (ESAT6) are secreted in abundance by Mycobacterium tuberculosis and are frequently recognized by T cells from infected people. The genes encoding these proteins have been deleted from the genome of the vaccine strain Bacille Calmette Guerin (BCG). CFP10 is one of a small number of secreted M. tuberculosis proteins now identified, that appear to play key roles in tuberculosis pathogenesis and in the stimulation of immunity. This antibody was raised by a genetic immunization technique. Genetic immunization can be used to generate antibodies by directly delivering antigen-coding DNA into the animal, rather than injecting a protein or peptide (Tang et al. PubMed: 1545867; Chambers and Johnston PubMed 12910245; Barry and Johnston PubMed: 9234514). The animal's cells produce the protein, which stimulates the animal's immune system to produce antibodies against that particular protein. 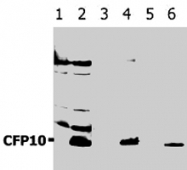 A vector coding for a partial fusion protein was used for genetic immunization of a mouse and the resulting serum was tested in Western blot against an E.coli lysate containing that partial fusion protein. Genetic immunization offers enormous advantages over the traditional protein-based immunization method. DNA is faster, cheaper and easier to produce and can be produced by standard techniques readily amenable to automation. Furthermore, the antibodies generated by genetic immunization are usually of superior quality with regard to specificity, affinity and recognizing the native protein. Figure 1. Western Blotting analysis (reducing conditions) of recombinant protein CFP10 using polyclonal anti-CFP10 antibody (AP03010PU-N): Lane 1, 3, 5: cell lysates of non-transfected E. coli (negative controls). Lane 2, 4, 6: cell lysate of CFP10-transfected E. coli; dilution (2) 0.5 μg/ml, (4) 0.2 μg/ml, (6) 0.1 μg/ml; detection with Donkey anti-rabbit/HRP secondary antibody. Western Blot: CFP10 Antibody [NB110-58737] - Western Blotting analysis (reducing conditions) of recombinant protein CFP10 using polyclonal anti-CFP10 antibody._x000d_Lane 1, 3, 5: cell lysates of non-transfected E. coli (negative controls)._x000d_Lane 2, 4, 6: cell lysate of CFP10-transfected E. coli; dilution (2) 0.5 µg/ml, (4) 0.2 µg/ml, (6) 0.1 µg/ml; detection with Donkey anti-rabbit / HRP secondary antibody . Western blotting analysis ( reducing conditions ) of recombinant protein CFP10 using CFP10 polyclonal antibody ( Cat # PAB1265 ) . Lane 1 , 3 , 5 : Cell lysates of non - transfected E. coli ( negative controls ) . 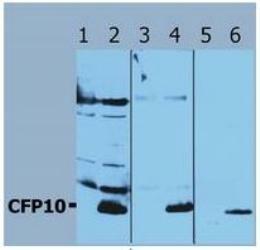 Lane 2 , 4 , 6 : Cell lysate of CFP10 - transfected E. coli; dilution ( 2 ) 0.5 µg/ml, ( 4 ) 0.2 µg/ml, ( 6 ) 0.1 µg/ml; detection with Donkey anti - rabbit / HRP secondary antibody.